As I'm learning to tame the beast that is my sewing machine, I've discovered the vibrant community of sewing and quilting blogs written by people who generously share tips, tutorials, advice and inspiration. 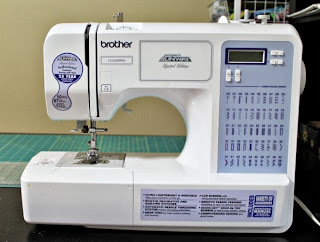 So, when I stumbled on this post asking for sewing machine reviews, I decided to jump in and contribute a review about my sewing machine. What brand and model do you have? I have the Brother CE-5500PRW Project Runway™ Limited Edition Computerized Sewing Machine. How long have you had it? I've owned this machine for 2.5 years. But the first year I owned it, I did not use it at all. I only looked at it anxiously from time to time before putting it back into the closet. How much does that machine cost (approximately)? I bought it for $135. What types of things do you sew (i.e. quilting, clothing, handbags, home dec projects, etc.)? I use it for piecing quilt tops, quilting and simple sewing projects like wallets and bags and pillowcase dresses. How much do you sew? How much wear and tear does the machine get? I sew two or three hours every week, on average. So the machine gets fairly light wear and tear. Do you like/love/hate your machine? Are you ambivalent? Passionate? Does your machine have a name? My machine is called Big Brother. I definitely like my machine- Big Brother is my buddy and we're learning to work together! What features does your machine have that work well for you? The machine is simple to use. Changing thread, loading bobbins, changing needles, changing feet was all easy to learn. The drop in bobbin is very convenient. The machine has 50 stitches or something ridiculous like that, but I only tend to use the straight stitch and the zig zag. My sister (who sews professionally) used the machine for a month when she was visiting me and she liked it very much. Is there anything that drives you nuts about your machine? I found it very difficult to sew multiple layers on this machine. Buying a walking foot has made this a lot easier, so I highly recommend buying a walking foot if you buy this machine. I've used my quilting teacher's Bernina once or twice, and using that very high-end machine gave me an experience of driving the Cadillac of sewing machines. So I understand that Big Brother is noisy and not as smooth as some machines are! The throat of the machine is small which will make it a challenge to quilt anything bigger than a crib sized or possible twin sized quilt. It works for me because I have no intentions of making big quilts. Would you recommend the machine to others? Why? I would certainly recommend this machine to beginners. Before you start sewing/quilting, you have no idea how much you'll use a machine and whether you'll end up liking these crafts, and it does not make sense to buy a high-end machine. I like to start small and work my way up. Brother makes very inexpensive machines that have good features. I have read many reviews that the machines are not durable and not sturdy and this may well be true, but so far mine is working well. Do you have a dream machine? If I'm still sewing and quilting avidly 3 years from now, I might splurge on a refurbished Bernina or Janome. I've been having great fun converting our spare bedroom into a sewing room/studio for myself. It is hard to describe the pleasure that comes from having a tidy, bright and cheerful space devoted to creative pursuits, and this is where I now do most of my sewing and blogging. Knitting is done strictly in front of the TV but the knitting supplies and other craft paraphernalia do live in this room! This space was inspired by photos of countless sewing rooms that I've seen on blogs and on Pinterest. My sewing room came together via lots of purchases at IKEA and some generous hand-me-downs from my quilting teacher- she gave me the ironing board and the thread rack. By one window is the sewing/cutting table, where Big Brother sits. The table is big enough for a cutting mat. V was nice enough to mount the thread rack onto the side of the bookcase so that thread is just at arm's length when I sit down to sew. There are stacked bins for my fabric. I've decided that I can only have as much fabric as can fit into these bins. When I mention this to quilter friends, they just laugh out loud. I have plans for the blank wall at the back- I want to make it a design wall like this one. Designs walls are very helpful for laying out quilt blocks to "audition" them. By the other window is a small desk- and this is where much of One Hot Stove is written. I learned a new technique called paper piecing and made this dog as a sample. Somehow the droopy ears reminded me of Dale and so I put it in a frame and it sits on my desk. My mother and sister gave me several adorable block-printed cotton fabrics from India. I put them in thrifted wooden embroidery hoops and now this cheerful grouping makes me smile every time I look at it. This has got to be the easiest wall decor project ever. It turns out that ironing seams is one of the most important steps in sewing and quilting. When I come into the room to sew, the first thing I do it to switch on the iron. 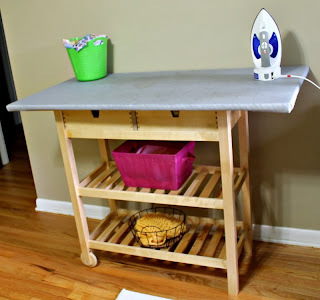 This ironing station was inspired by this one that I pinned here and is Pin #1 for this month's Pin It and Do It challenge. Psst- if you're looking for motivation to try something you've pinned, it is not too late to sign up. I found this button rug at IKEA and just couldn't resist buying it for the sewing room.The tapestry was a gift from my parents- they bought it on their travels through India. I think it is Pipli applique work from Orissa. Duncan likes to drape himself decoratively on the rug. My button jar. It makes me inordinately happy. Have a wonderful Sunday and I'll see you be back on Tuesday or Wednesday with an apple dessert. 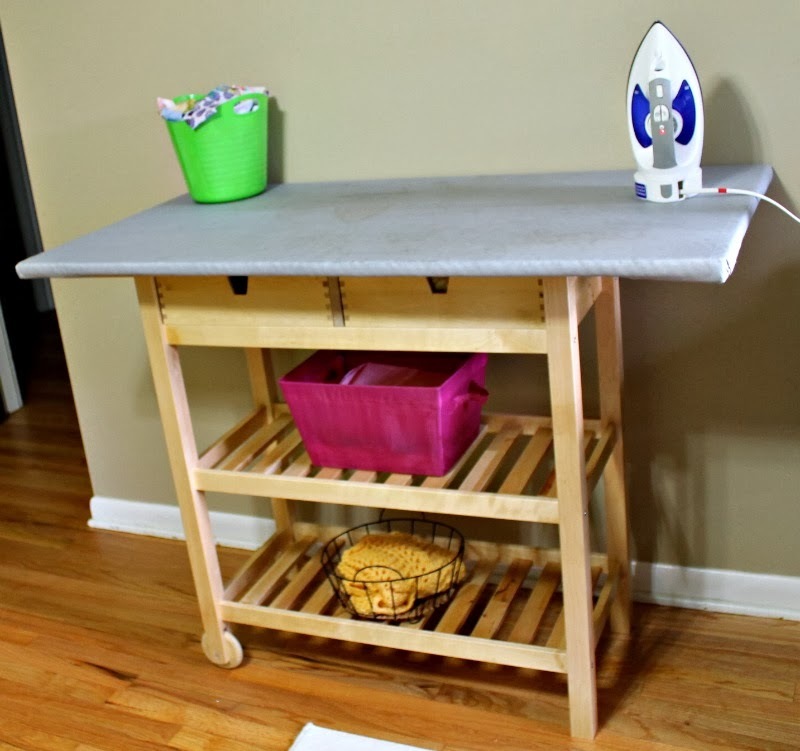 I'm chuckling over the ironing station, because I have an ironing board in my food props room, even though I rarely iron my clothes. I have a Kenmore sewing machine, but I'm afraid it hasn't gotten much use the last few years. I bet you'll have so much fun with this! I am enjoying all this very much, Kalyn! So are you using your ironing board as a portable surface for taking food pics? Good idea. Wow! What a beautiful sewing room you have Nupur! I had seen this embroidery hoops wall art on some blog and had made a mental note of it :) It's my dream to have a big craft room whenever we buy a house. My mom got me interested in quilting. She made me a full size quilt and it's 100% hand-made, and she's not a quilter. A couple of my friends here (one is in late fifties and the other is 80 :D) have been quilting for years and have made the most amazing quilts I have ever seen - one's quilts have even won at quite a few quilting shows. I would definitely love to quilt some day. For now I'm sticking to bags and basic sewing stuff. And next one is going to be a halloween costume for my darling daughter. I wanted to sew SO bad but it was frustrating for me initially as I couldn't even get a straight seam. I made my first bag on my friend's $3000 Bernina and just loved that machine. It was really brave of her to let me use that machine when I was sewing for the first time LOL! Then I tried a few things on my own and really enjoy sewing now. My friend even gave me her old machine to see how I like sewing and told me to keep it for as long as I want. I feel that these passionate quilters are very generous and helping others learn the craft really makes them happy. Hi Amruta! Quilting is nothing but sewing a quilt- if you sew (whether by hand or machine) you're halfway there. So what Halloween costume are you planning for your little one? Oh those Berninas sew so smoothly, don't they? Something to save one's pennies for. And I agree 110% that quilters are a most generous and welcoming bunch. The workspace is all so pretty. And inspirational. Awesome set up, looks very organized! I do like to be a bit organized. Mess/clutter makes me very anxious!! 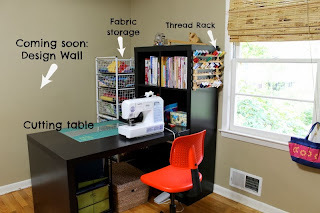 Your sewing room is so cute, especially love the hoops wall display and the ironing table (I have the same island from Ikea). Funny thing, Pavani, is that sometimes it takes a long time to get into sewing but once you get started you're off and running. It has to be the right time in one's life and I know you have two little ones. If at all you have the space, keep the sewing machine until you have time to play with it. And this is coming from someone who never advocates keeping stuff! You never cease to amaze me Nupur! What an awesome display..and the button jar is THE cutest ever. Thanks :) I hoard buttons like a squirrel hoards nuts! My Mom is a sewing master, that’s what I tease her. She bought a new machine during my pregnancy and started off stitching everything that my baby might require, right from his quilts, nappies, bibs, zablas to storage organizer for his clothes, I can go on. Not just stitched them but embroidered and did everything related to it. I’m totally inspired by your room, just makes me feel she needs something like this. I’m planning to click the snaps of her creations and post sooner or later, you would like it. OMG I would LOVE to see what your ma made for your little one. New babies definitely are a great inspiration to whip up cute little sewing projects. My mom and sis also went crazy with their machines and made so many tiny dresses et al for my daughter. And yes, that would be an awesome gift for your mom, to set up a little sewing corner/room for her. It will tell her that you admire and support her craft. Come make over my sewing room!!! It's a giant mess right now and it desperately needs an overhaul. I do have a design wall but I hadn't thought to attach it to the wall with Velcro (or to use duct tape--much better than the lousy glue gun job. Thanks for participating in the challenge! I can definitely come and organize your sewing room. But you might hate me because I don't shy away from culling stuff ruthlessly :D Thanks so much for posting the pin it event- it motivates me! Thanks Priti! I am so completely thankful to have this room as my own- the windows stream in sunlight and give me a view of trees/changing seasons as I sit and work/play. I can totally imagine that! :-) what a beautiful view and natural light. This room is full of positive vibes. I think it's beautiful inside out and I love the fact that it is yours. :-) I am rarely impressed by the picture perfect rooms displayed in interior magazines. You my dear, have been able to strike a perfect balance in making it beautiful and so homely at the same time. So proud of you. Yup- it is the ubiquitous EXPEDIT bookcase from IKEA all right!! Basic and affordable and just what I needed for this space. What a cheery, uncuttered room. The rug is so cute. I meant uncluttered, of course. I love love love your craft room. It is my dream to have a room like that for all my crafts. Now I use V's computer table as my sewing table when he is at work. It is so uncomfortable to move all his monitors away and setup the machine. There is no space in the apartment for another table. I understand that small apartments can be challenging, Shilpa. For me, it has made all the difference in the world to be able to have the machine set up so I can sit down and sew even for a few minutes at a time. Hi Nupur, I bought a sewing machine years ago with the ambitious plan of making my own curtains, and I am totally embarrassed to admit that I haven't touched it since. 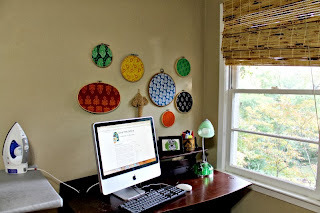 I love your little work nook, and those colorful fabrics framed in embroidery hoops-- what a neat idea! Enjoyed the peek into your sewing world. Vaishali- you never know, you may get started when you have a little time on your hands and then your sewing may take off! ooh your post is so tempting nupur! loved your little room. Just yesterday I took my mom to Michael's to buy some paints and I was looking at various spools of wool they have and I thought to myself that it would be awesome to be able to knit! I recently had a baby and wanted to make warm blankets for him..but then I browsed through some of the knitting books they had and all the material just intimidated me.. Also, I somehow have a feeling that I will not end up liking sewing or knitting since they require so much patience and I am a very restless person by nature! lol .. Did you have similar doubts when you first started out? Love, love every single thing you have done to the sewing room! Very inspiring! I need to get my Brother out:) thanks for the motivation! Thanks Mona! Would love to see what you make with your Brother! 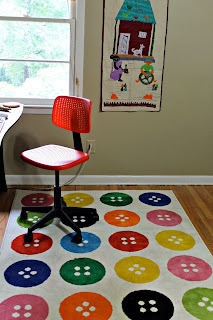 What a nice craft room and love the rug! 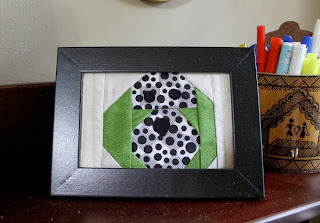 I'd love for you to stop by and link up your craft room ideas! Stop by Sewlicious Home Decor craft room ideas just follow this link...http://sewlicioushomedecor.com/sew-organized/. 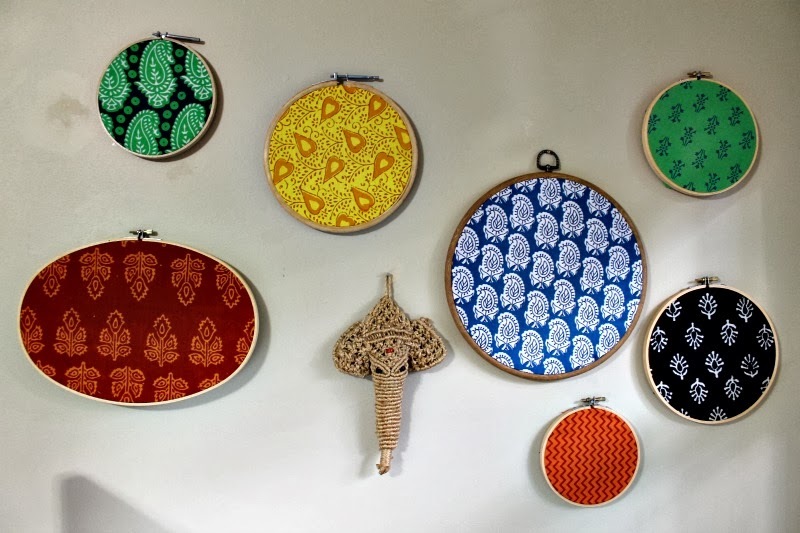 Love the cheerful fabrics in embroidery hoops as wall decor. Very creative! Well only a few months ago I couldn't sew either :) One has to start somewhere and learn! I am a big fan of organization and decoration. I'm just not a good exponent of it. Your space is wonderful and I'm sure you will be very productive in such nice environs. Saw that fabric hoop idea on Pinterest buy your fabrics make it very pretty. Thanks for sharing. Arpita- it is just so true, at least for me, that a nice clean and pleasing space results in productivity and creativity! I do love these block prints from India, they are just darling fabrics. Hi Nupur your workspaces are so cheerful! I have created a multipurpose desk by my bay window for crafting, ironing and anything else. I loved the hoops and fabrics display. 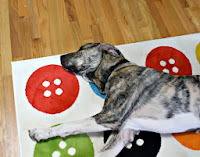 Can't decide if the button rug is more adorable or Duncan, I'll go for Duncan though :). This apple cake looks like a good idea when you are flooded with the fruit. Cheers! Duncan is the most adorable thing in the room for sure! Also the most vexing because his hair gets everywhere and he makes me vacuum it every couple days! Your sewing room is soo nice and organized . Oh no you didn't :D :D OK who am I to talk? I have a small rubbermaid tote of spices in the family room closet. Hi Nupur, are you indian? ?And curently where do you live?